I was on a mission to find a special key required to turn on the exterior water when I made the connection. My mission, which later failed, included setting up a 500 gallon dunk tank with a glass window along Main Mall for Imagine Day. Big enough to be submerged with scuba gear, waving to the passing students. A publicity stunt, a great idea, but lost in a logistical nightmare unfortunately, shelved for another time. Navigating the upper levels of the SUB, AMS security gesturing for me to come over, following them through the maze of offices in search of the key master. On route through the mayhem I was sidetracked and introduced to AMS First Week Coordinator Jenna Earnshaw and bestowed a new scuba mission. 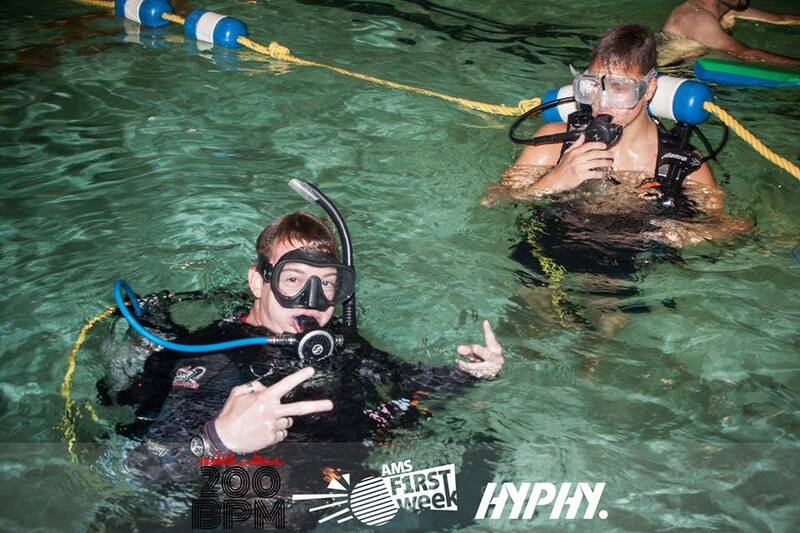 Free scuba diving lessons during First Weeks Wet N’ Wild Pool Party. The following Wednesday evening, on a converted YVR airport cart, I wheeled the diving gear into the back door of the pool. As I opened the door, the pool water was unusually calm. No one was in the water; the pool had been closed off for the night’s festivities, an ere silence. As I wheeled the gear along the deck I made eye contact with one of the lifeguards. The look she gave me was my first indication this was going to be something different then I had initially expected. I didn’t know much about this Wet N’ Wild business, I had accepted my scuba mission with little thought. I like Parties, Pools, and Scuba Diving. If you put them all together and make a little money it’s going to be a win all around, mission accomplished. “Are you diving tonight?” a concerned voice from the lifeguard. Looking at me closely, evaluating my response carefully. Was he serious? Looking up I saw a DJ put the finishing touches on his station. A DJ booth set up to overlook the pool, massive speaker towers on each side. From his perch all he needed was a Mickey Mouse looking helmet and this would be a Deadmau5 concert, laser lights in all. A small army worked control and safety in preparations for the throngs of people lined up at the door. Security guards and lifeguards posted at every corner. On top of the 5m diving board a supervisor with clear vantage point radios instructions to his subordinates. The lights went out as the DJ began to sling his beats. Laser lights shooting across the pool as the doors opened and party-goers in swimsuits began to enter. I stood there in scuba, colourful reflections bouncing off my mask. This party was about to begin. I had brought with addition to my gear 5 sets of rentals. My image of conducting a 5 person Discover Scuba Diving Class at a time however soon faded as the reality of the scope of this party set in, I had to reevaluate. To maintain an appropriate level of control during this mayhem I needed to readjust my ratio, this class as it turns out, was going to need to be 1:1 instruction. As the scuba diving commenced I got an interesting perspective of the concert unfolding on the surface. On the surface the sounds around you could only be described as pure chaos, an incoherent mash up of noise filling the air. Incredibly loud, incredibly fast, too many noises for your brain pick apart, all echoing on the surface of the water. Your mind struggling to build a suitable image of what exactly is going on around you. It was in fact true chaos of the ears. The chaos however was brought back in line as your ears filled with water and you descend beneath the surface. The steady thump of the bass acted as the metronome to align the beat as the vibrations entered the water. The noise faded and the steady thump of the bass was all that was left, BOOM….. BOOM….. BOOM… ripples through the water. At the bottom it’s not so much as you hear the bass anymore, but you feel it. Feel it pulsing against your chest with every beat; BOOM… BOOM… BOOM… It’s as if the steady beat from your heart and the bass become one. The BOOM becomes the blood flowing through your body, surging life up through your hands and fingers, pulsing all the way to the tips with every beat. Looking around through the water you see hundreds of unidentifiable legs and torsos jumping up, down and moving all around. Moving in slow motion due to the high resistances of the water. Legs and torsos flashing momentarily, and then disappearing again in the darkness of the pool, illuminated briefly by laser light beams as they shoot through water column. Thousands of bubbles suddenly shoot down in the water, bubbles floating away to reveal of person curled up in a ball that just jumped in. Repeat explosions of bubbles erupting randomly all around from the surface begs the question what exactly is going on up there. Kneeling there in the safety of the darkness and depth of the pool I couldn’t help but be in wonder as I watched the party unfold. It was a definite first in scuba diving experiences for me. My employer spared no expense for this party, what a party, a true pleasure of the senses. Welcome to UBC everyone, let’s have another great year.